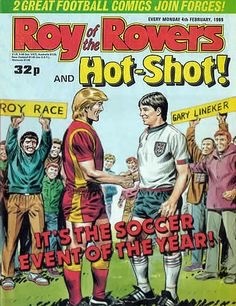 Between 1954 and 1993 millions of football fans enjoyed following the fortunes of star footballer Roy Race in his Roy of the Rovers storyline (originally in Tiger, later graduating to his own comic). Although the vast majority of his adventures concerned his club Melchester Rovers – and briefly Walford Rovers – there would occasionally be a chance to follow Roy in action for England. The most memorable such instance came in January 1978, Roy taking temporary charge of the national team after the manager was injured in a car crash. As at Melchester, he was to be player-manager. 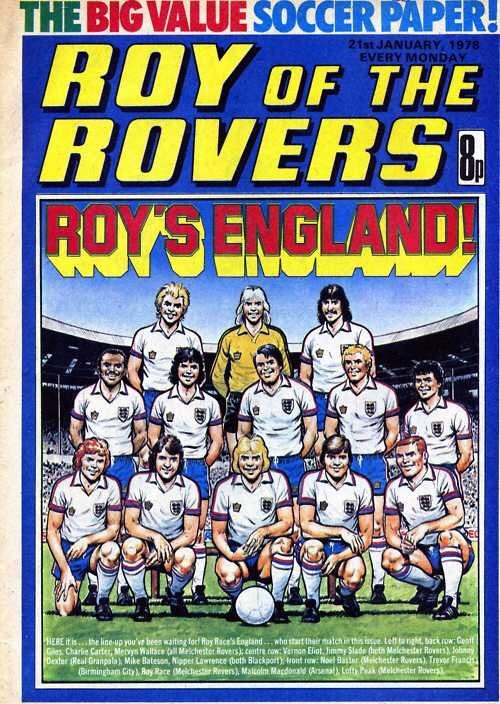 The 13-man squad Roy picked would have been familiar to regular comic readers, given that eight of the players selected came from Melchester Rovers and featured regularly in Roy of the Rovers. Johnny Dexter was lead character in The Hard Man in Roy of the Rovers while Nipper Lawrence and Mike Bateson were from the Nipper storyline which appeared in sister title Tiger and Scorcher. At least Roy stopped short of calling up the eternally 12-year-old Billy Dane of Billy’s Boots fame! The vast majority of the time, Roy existed in a clearly fictional world which comprised of make-believe people and teams. But there were occasions when this wasn’t totally the case and in his England squad were Birmingham City forward Trevor Francis and Arsenal striker Malcolm ‘Supermac’ Macdonald – the latter having not played for England since 1976. Other real-life stars such as Kevin Keegan were nowhere to be seen. But there was a good reason why Francis and Macdonald were named in the side – they each had a column in Tiger and Scorcher. If you took their selections literally then everyone was now living in the same universe, in which Arsenal co-existed alongside Melchester Rovers and where Trevor Francis could appear with Roy Race. Sir Alf Ramsey becomes caretaker manager of Melchester Rovers in 1982. And the willingness to mix the two worlds would continue in the coming years. Sir Alf Ramsey took over as Melchester Rovers caretaker manager in 1982 after Roy was shot; Bobby Robson featured in the storyline as he considered whether to select Roy for his England squad in the mid-1980s; cricketer Geoffrey Boycott became Melchester chairman during the same period and then came the infamous decision to have Spandau Ballet’s Martin Kemp and Steve Norman in the Melchester side along with the retired duo of Emlyn Hughes and Bob Wilson (the latter having last played professionally 11 years earlier!). It didn’t sit comfortably with loyal fans of the comic, including Frank Skinner. Later there would be characters – albeit under different names – who couldn’t have been more obviously based on Jimmy Greaves and Paul Gascoigne. It all made a mockery of the small print that all characters appearing in the storylines were fictional and any resemblance to real people was coincidental. Meanwhile, Mr Squeaky Clean met Mr Squeaky Clean as Roy and Gary Lineker struck up a friendship that led to them releasing a single together. But going back to 1978, was the average schoolboy reader bothered about having real stars joining the storyline regulars to play for England? Probably not. They no doubt just wished that things could work the other way round and Roy could play for England in real-life! The choice of the Netherlands as England’s opponents was probably not coincidental. They had won acclaim in real-life with their run to the 1974 World Cup final and in 1977 had looked a class above in winning 2-0 at Wembley in a friendly. 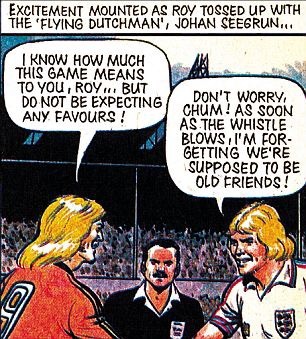 This would effectively be a rematch, although unlike with England the Dutch side would be totally fictional – as Roy was reunited with an old “chum” in Dutch captain Johan Seegrun. Soon ‘Supermac’ would break the deadlock as England gloriously went on to win 5-1. Fans depicted watching the match at Wembley or on TV were shown looking delighted with the result, including one armchair viewer who – having earlier been castigated by his wife for criticising Roy’s decision to pick himself – was declaring the new manager had done the country proud. The night really had been ‘Roy of the Rovers stuff’. Malcolm Macdonald sends England on their way to a 5-1 win. There then followed a tug of love as Roy considered whether to become full-time manager of England or remain at Melchester. Club would ultimately win over country in the battle for Roy’s heart. He later played a couple of times for England under Bobby Robson in the mid-1980s. That proved to be the end of his full international career, although he would spend the summer of 1992 leading the England B team to success in a mini-tournament as player-manager. It has to be said that, given how prolific and skilled Roy was, he made a surprisingly low number of appearances in an England shirt during his 39-year playing career (during which he aged remarkably well!). There are probably three reasons for this. Firstly, the title of the storyline was Roy of the Rovers and therefore his club endeavours were always intended as the main focus. Secondly, constantly switching between what Roy did for Melchester and England would have disrupted the flow of the story. And thirdly, a fair proportion of readers were not English. Whereas everybody would get behind Roy when he donned the Rovers shirt, those from other parts of the UK or overseas may have not felt the same desire to see him firing them in for England. Roy Race teams up with Gary Lineker in 1989. Roy’s playing career ended with a helicopter crash in 1993, the underlying reason being falling sales of his weekly comic. 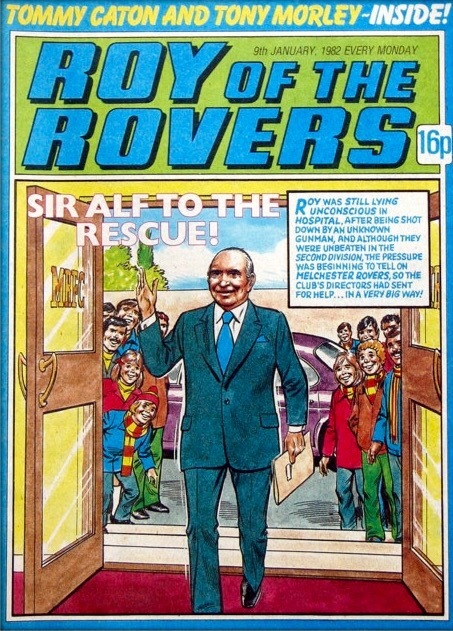 Revivals of the storyline – with son Rocky now playing up front for Rovers – in a new monthly Roy of the Rovers comic and the magazines Shoot! and in Match of the Day all proved fairly short-lived, with the last official new storylines appearing on the shelves as far back as 2001. But those who have missed their regular ROTR fix can enjoy regular adventures at at ‘Storky Knight’s’ website containing fresh storylines, including some set in past seasons. Looking at the site, the newest story sees Melchester managed by Johan Seegrun – the Dutch captain during that 5-1 defeat by Roy Race’s England in 1978. In a hectic era when he got married, became a father to twins, suffered the most unlikely of relegations and was almost killed after being shot, Racey’s time in charge of his country stood out as another memorable moment for Roy of the Rovers.